Arsenal manager Arsene Wenger has defended David Ospina, describing the recent criticism of his goalkeeper as "not analysis of football". Ospina dropped a corner into his own net as Arsenal lost 3-2 to Olympiakos with Petr Cech on the bench. 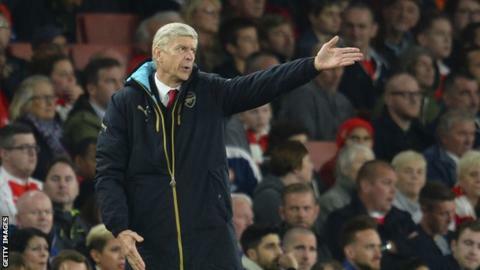 Tuesday's second consecutive Champions League loss leaves Wenger's side in danger of failing to reach the last 16. "To kill a player like Ospina, I find that just sensationalism. This is a top, top quality player," Wenger said. "If it is combined with real analysis of numbers that justify that, I will say: 'OK, they are right.' But just because one guy on the television says something, everybody says exactly the same. "I don't agree with that. It makes me angry because I think it is unfair to the player." Speaking at Friday's news conference before Sunday's home match with Manchester United, Wenger had already called the press "boring" after getting involved in a row with a journalist over team selection.